NOTE: THIS DECORATIVE PIECE WILL BE FOR SALE. Let’s get this DIY started! 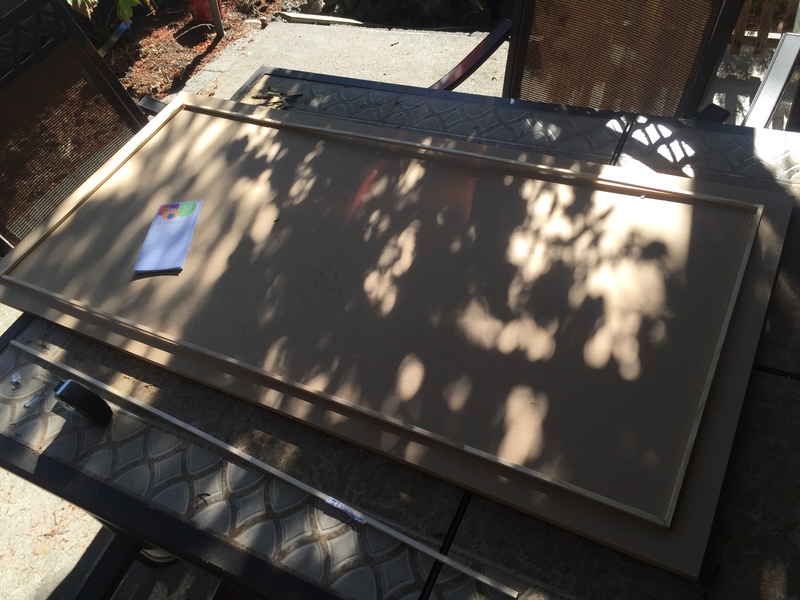 Next, I needed wood for the frame. At first, I was looking through the isle of house trim. And when my frugal self refused to pay as much as I wanted, I browsed the rest of the wood isles. That’s when I found the square dowels! These were only 97 cents each! I bought 5 incase I messed one up when cutting them. I was afraid that I might fray or split the ends because they were so small. (But I didn’t screw any of them up!) These cost me $4.85 total. 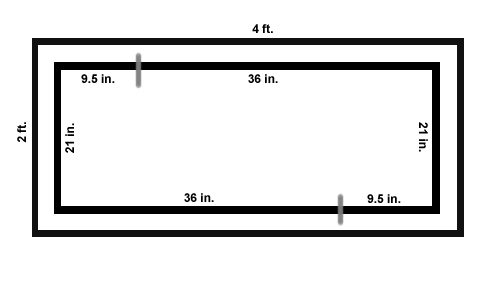 The diagram above shows the measurements for the whole backdrop, as well as the dowels. They had to but cut, and they weren’t long enough to go the length of the frame. But, we will hide the seams with caulk, so no need to worry about it not reaching the entire length. 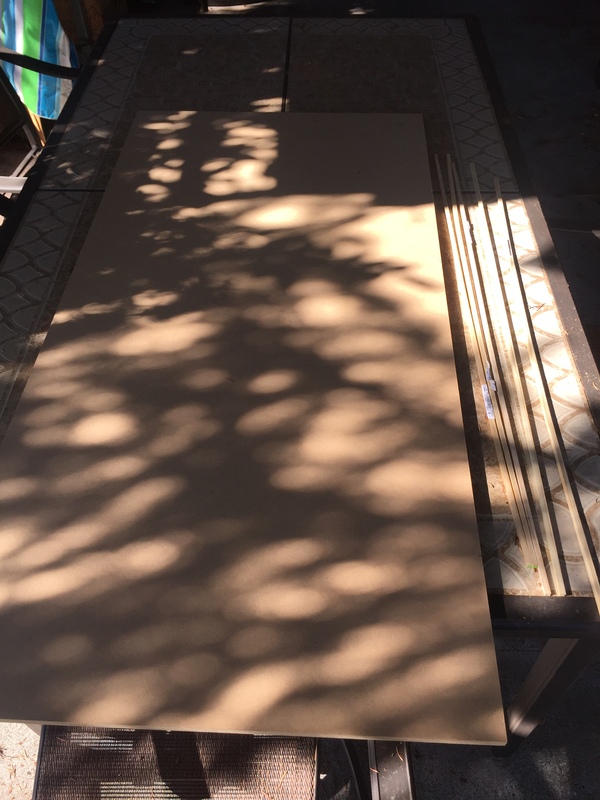 I used a table saw to cut each piece. NOTE: If you don’t know how to use an electric saw, seek help from someone who does. 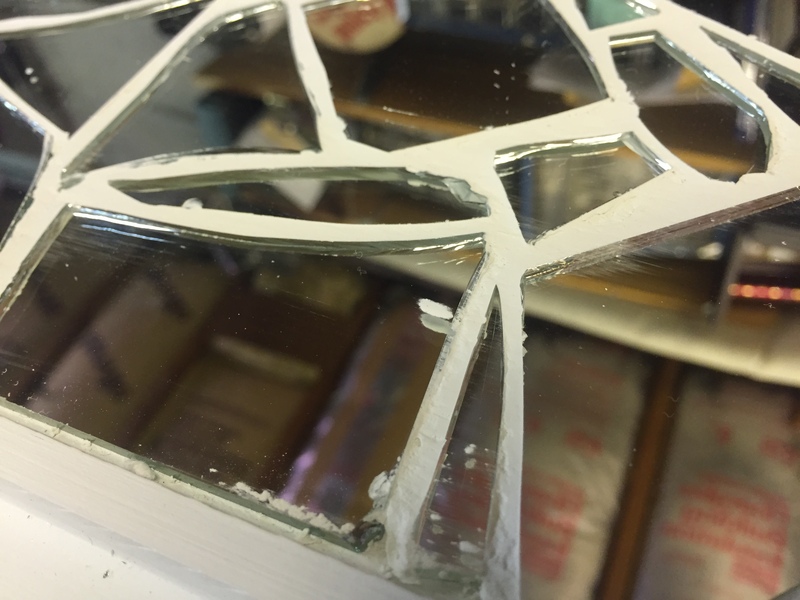 The next step in this project is to caulk the frame to create a seamless look. 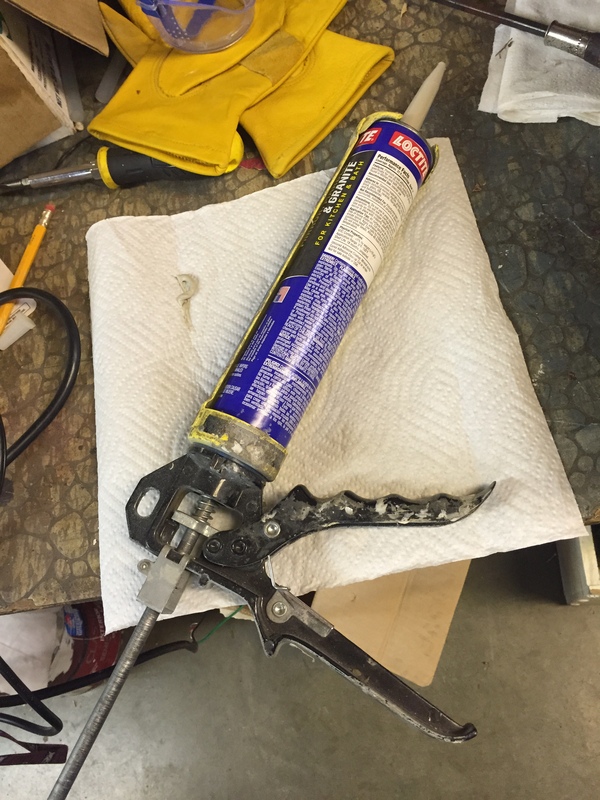 Make sure to use caulk that is paintable! 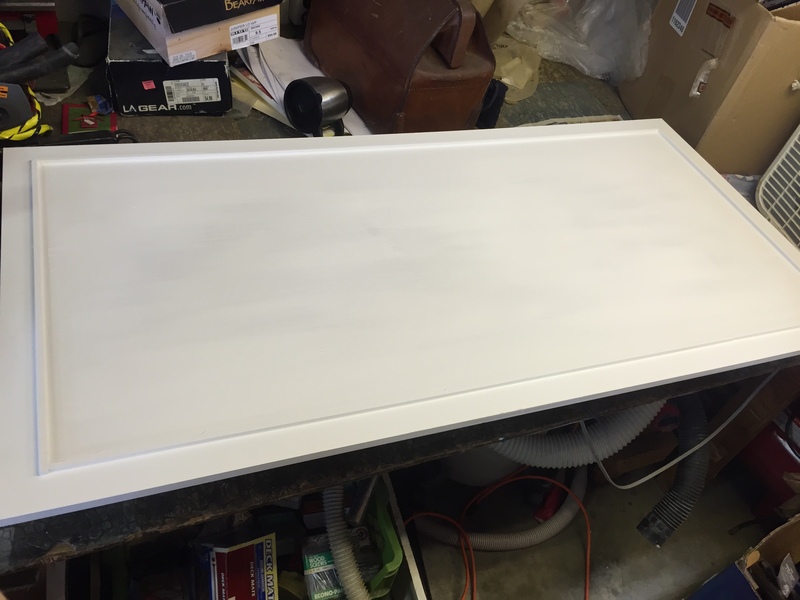 I used white because I knew that I wanted to paint the backdrop white…and it was the color I knew was already in my dad’s garage. AKA: free. 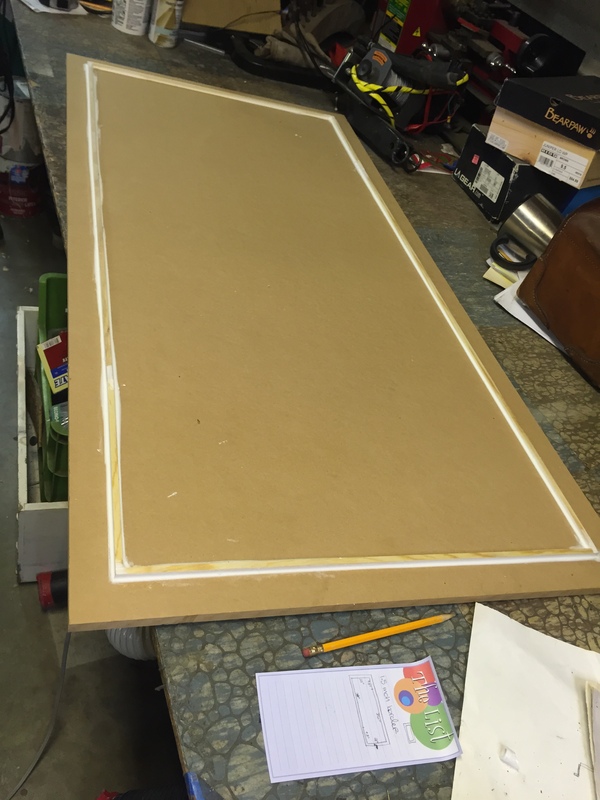 To caulk the edges, all you need to do is squeeze a thin line along each side of the frame using a caulking gun. 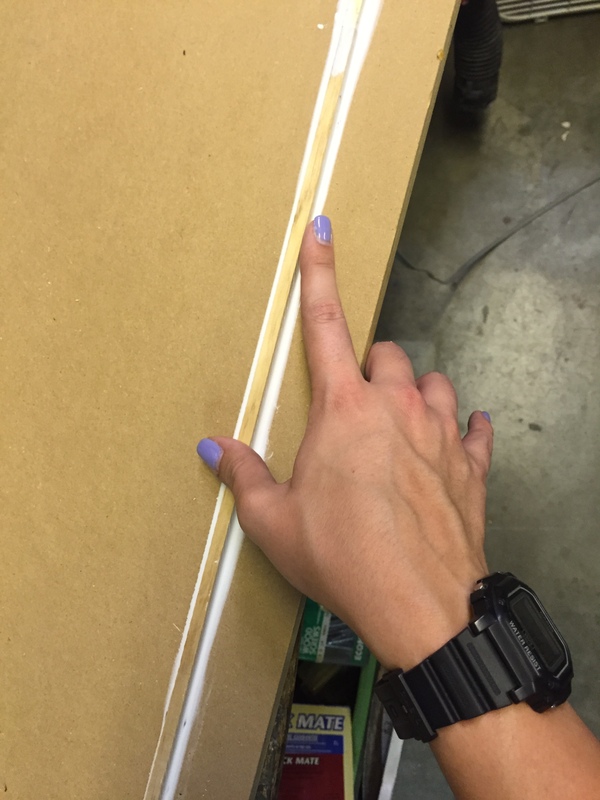 Then smooth the line with your finger, pressing the caulk into the corner to hide the seam. NOTE: A little caulk goes a long way! 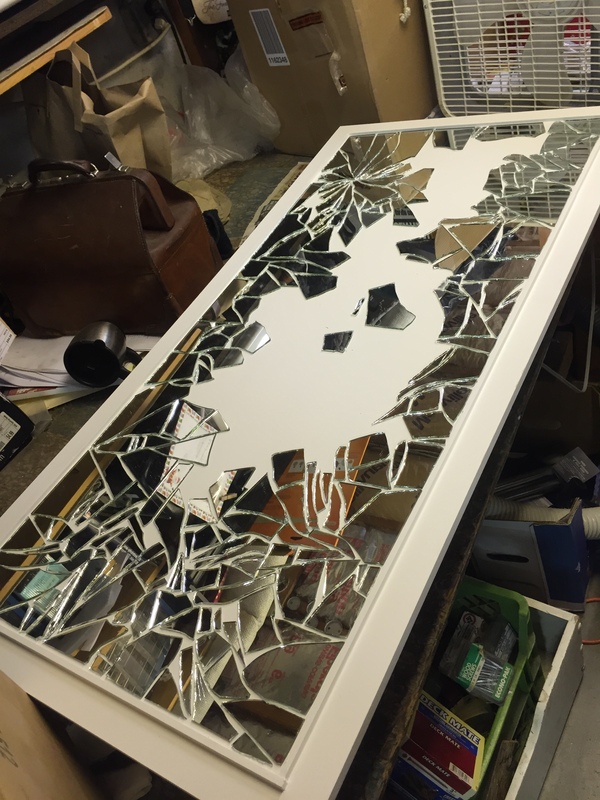 Alright folks, it is time for the adventure of breaking your mirror! 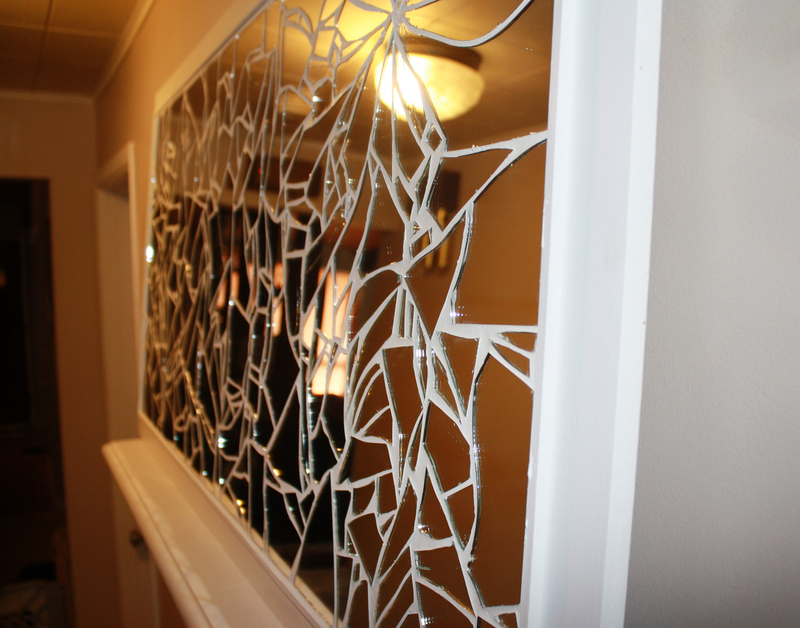 Luckily, I don’t believe in any of that bad luck crap for breaking a mirror. If you do….you might want to have someone else do this part. 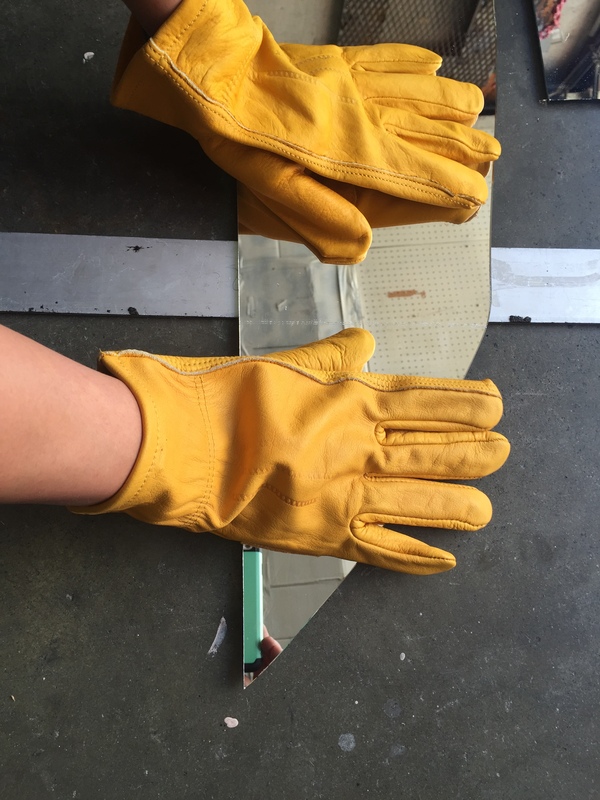 First, I placed a metal ruler under the mirror and applied pressure with my (GLOVED) hands to break the mirror into smaller pieces. 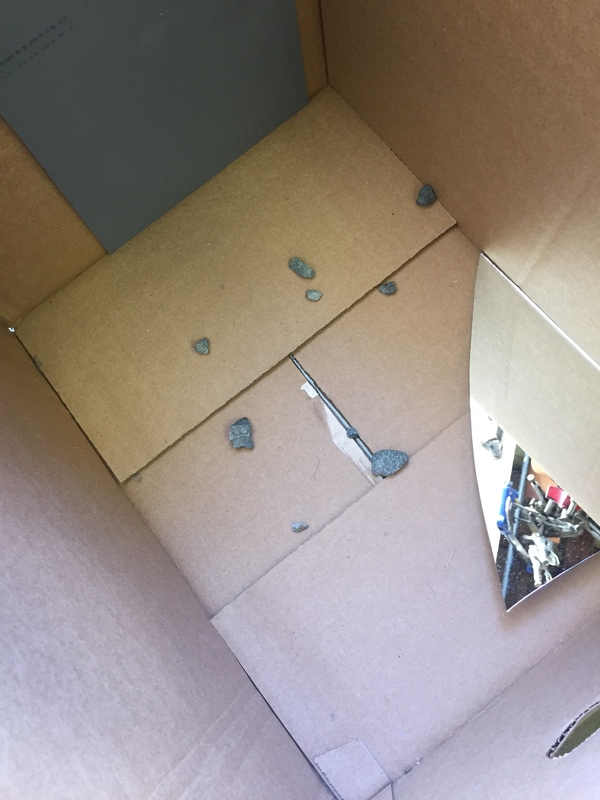 I just needed chunks that would fit into the box, so that the shattering process would be a little bit more controlled. 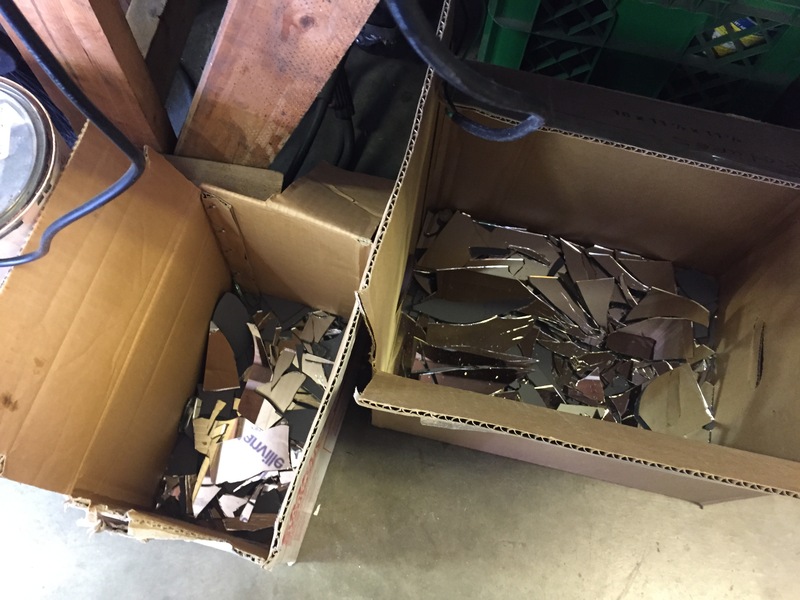 Just imagine those pieces going everywhere…Seriously man…just use the box. NOTE: I used two boxes. I figured it would prevent too much smashing. The pieces on the bottom will just continue to get smaller. And like I said, I wanted a lot of usable pieces. I think this goes without saying, but next you get to arrange the pieces. Make sure to still wear your gloves during this part, the edges are sharp! I started with the straight-edged pieces for the outside, and worked my way inward. Keep in mind that this part takes a longggg time. Way longer than I anticipated anyway. 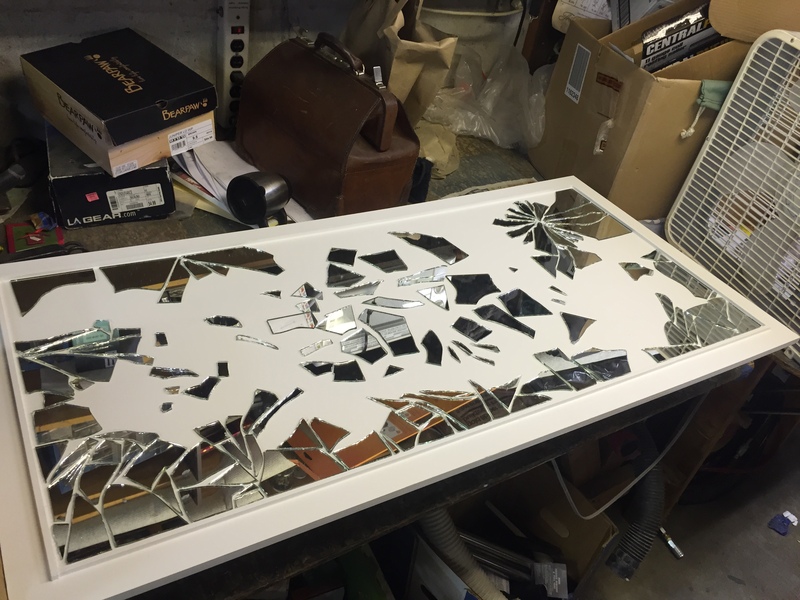 Once all your pieces are arranged how you’d like them, its time to glue them down. 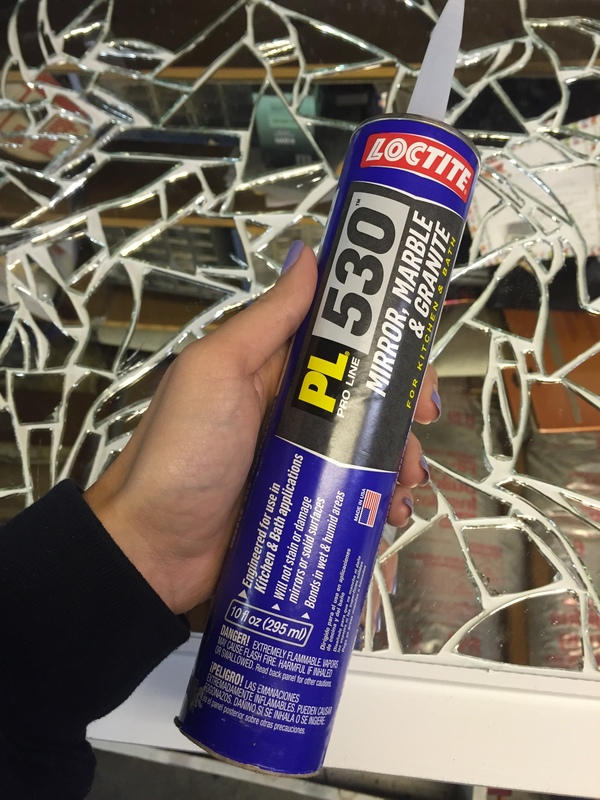 You cannot use just any glue when you’re working with a mirror. You MUST use mirror-specific glue. 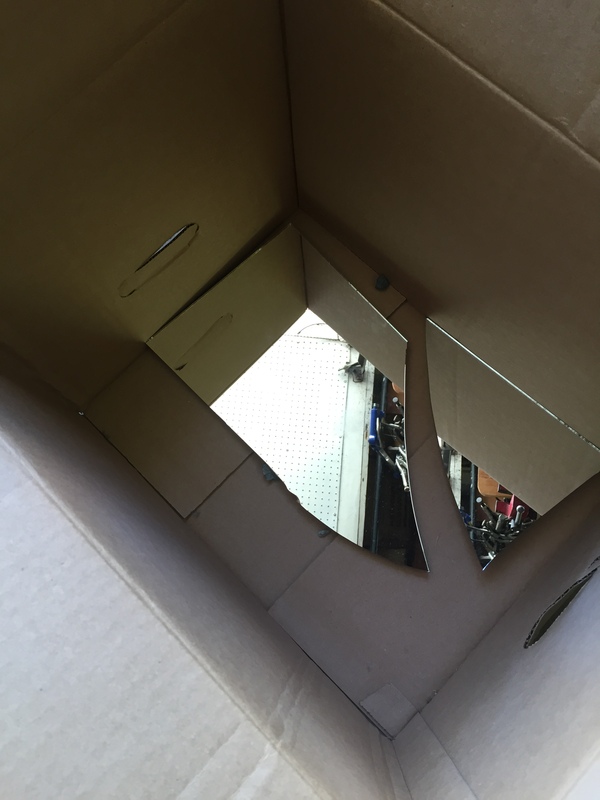 Any other glue will erode the silver on the back of the mirror over time. I got this one from Home Depot for $4. 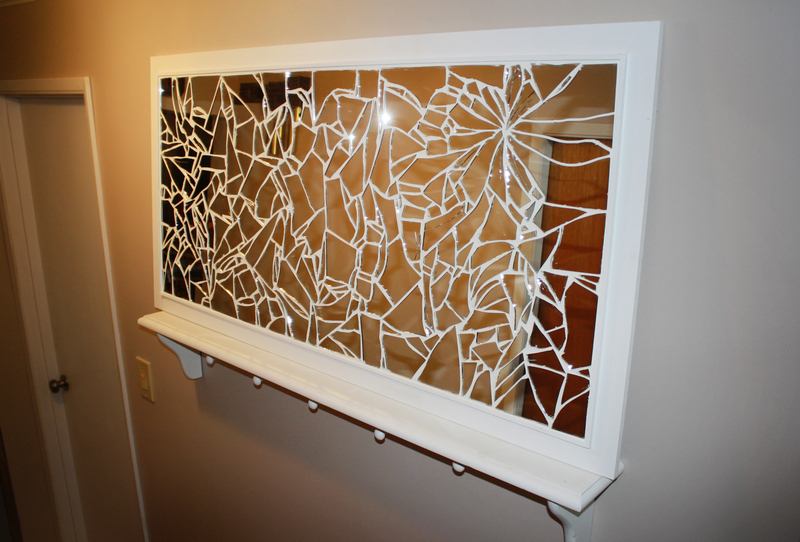 Using a calking gun, apply glue to the back of each piece of mirror and press it into it’s place. 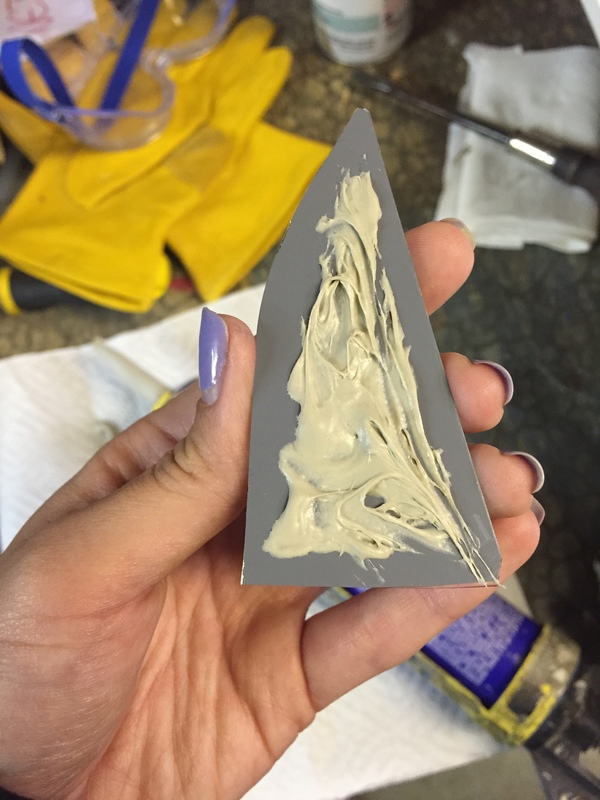 Then make sure you allow at least 24 hours for drying after your glue the last piece. I say that because it took me DAYS to glue all of them down. Which was also a step that took WAY longer than I thought it would. PLEASEEEEE wear gloves any time you touch the edges of the mirror. The first image is after I applied the first layer of grout. 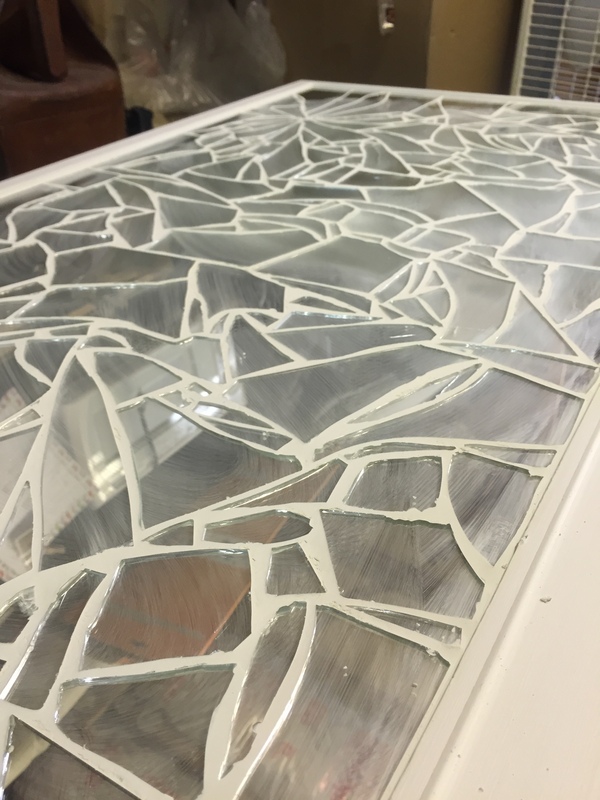 I used white non-sanded grout because the space between the pieces of mirror is 1/8 of an inch or less in places. The grout I also bought from Home Depot for $8. It was super simple. (Sorry, I forgot to take pictures of this process.) It came in a container, and all I had to do was add water and mix it well. The directions on the container have pictures and great descriptions. Although, I used a plastic putty knife to spread it instead of a float because I didn’t want to buy one. Again…frugal. 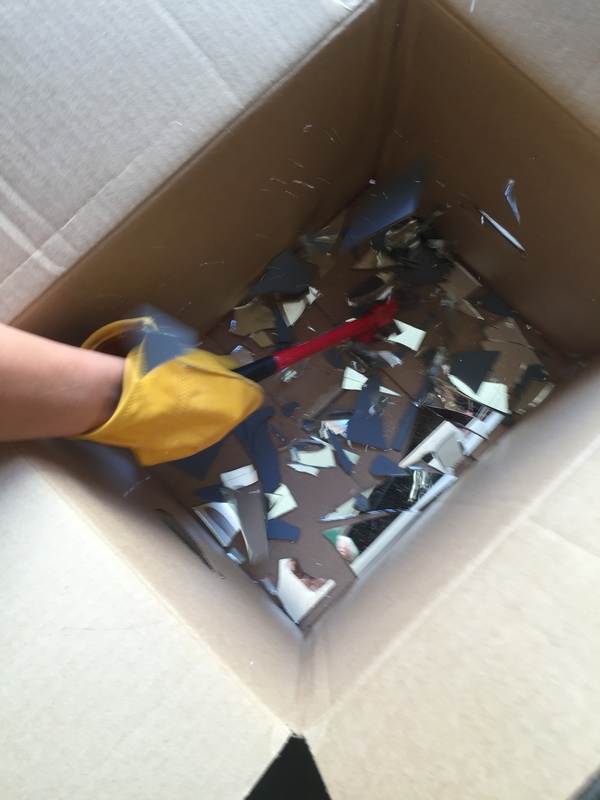 NOTE: a metal putty knife will scratch your mirror. USE PLASTIC! 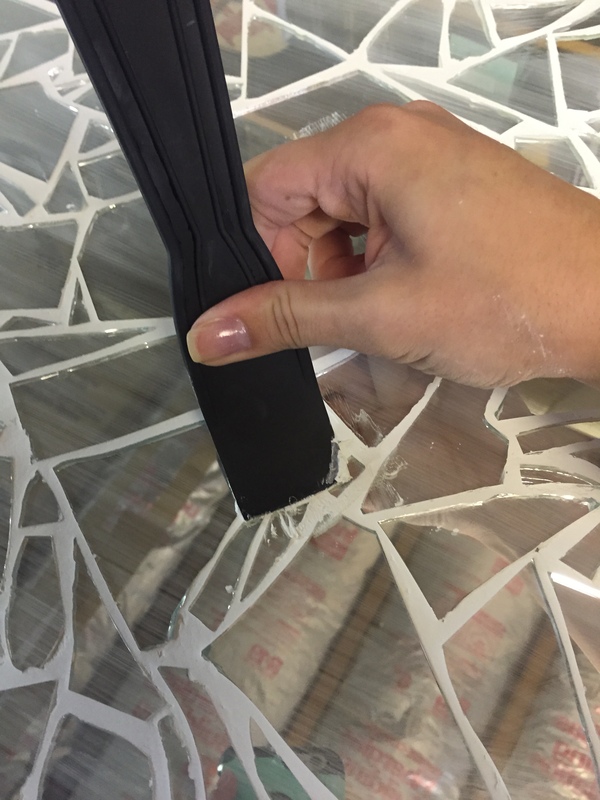 After the first layer has dried for 20 minuets, use a damp sponge to clean off the extra grout from the mirror. 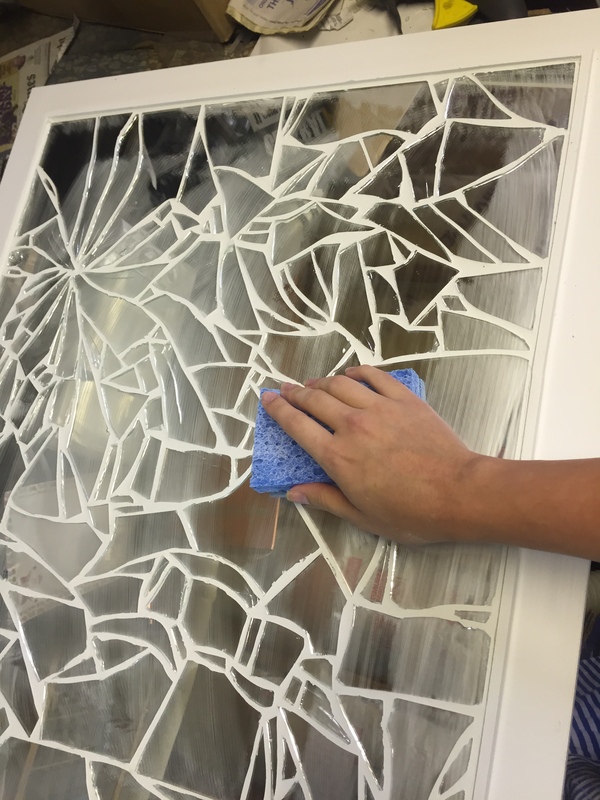 There will be a fog left on the mirror that can be wiped away with a dry cloth once the grout has dried for 2-3 hours. After my first go at this was completely dry, I decided to go over places with another coat because it was messy, and I simply missed some places. The final product turned out so lovely and was completely worth the effort! As always, let me know if you try this project out for yourself! Leave a comment and subscribe below!